Who would have thought stumperies would be the next new, new thing in gardening? Stumperies hail from the 19th-century British Romantic Movement, which rejected the classical forms of the past while exaggerating the glories of nature. Who would have thought stumperies would be the next new, new thing in gardening? Stumperies, you say? Never heard of them? Me either, until I read about the secret stumpery Prince Charles created at his Highgrove estate. Now the garden world is reverberating with the idea of these enchanted woodland hideaway gardens where upside-down stumps become art and ferns reign supreme. Stumperies hail from the 19th-century British Romantic Movement, which rejected the classical forms of the past while exaggerating the glories of nature. Edward Cooke created the first stumpery in Staffordshire, England, at Biddulph Grange in the mid-1800s. Influenced by the equally odd idea of "rooteries," he piled up 10-foot-high walls of stumps and roots on either side of a path in his garden. The concept of stumps as both artistic element and fern scaffold was born. Now Prince Charles has resurrected this Victorian idea, and it's spread to Vashon Island, where Pat and Walt Riehl are busy hauling around stumps and planting ferns. 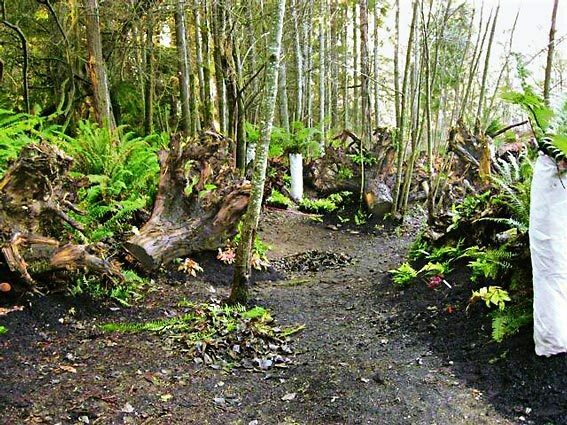 Their 9,000-square-foot woodland is the largest stumpery in the United States, according to fern expert Martin Rickard, who traveled from England to help them design the garden and place the stumps. He hints it might even be larger than the royal stumpery at Highgrove. "We're still in the planting phase," says Pat Riehl, who toured fern gardens in Europe before setting in to build hers. She visited Highgrove and a small stumpery at Dyffryn near Cardiff in Wales, and Rickard showed her "nearly every tree fern in the United Kingdom." Riehl came home a stumpery convert. "They're magical, like Alice in Wonderland," she explains. Last autumn, in what might be the ultimate in recycling nature, the Riehls hauled in 55 hefty madrone and Doug fir stumps rescued from Vashon construction sites. They found that wasn't nearly enough, and have since "gilded the lily," as Pat puts it, with another 40 stumps. Artistically placed with their roots up in the air, or on their sides, the stumps form the contours of the new garden, with paths winding between them. Walt even built a metal armature to support a tunnel of stumps. "It's a whole environment, you become submerged in it," says Pat. "When you walk into the garden everything else disappears." Rickard was so thrilled with our native sword ferns he wouldn't let Pat get rid of a one. She's added a wide variety of ferns, in the crevices and all around the stumps, and has plans for epimedium, hostas and more specialty ferns as the garden matures a bit. In a year or two the 11 tree ferns (Dicksonia antarctica) she's planted will form a fluffy understory beneath the conifers. And now in early June, Rickard is coming back to Seattle to talk about stumperies at this year's Fern Fest celebration and sale. This guy knows his ferns. He not only owned the largest collection of hardy ferns in the world but also writes the fern sections of the Royal Horticultural Society encyclopedia. He's speaking Friday evening, June 6, on lesser-known species of ferns ideal for our climate. "I'll talk about my favorite tree ferns," says Rickard. "They have so much potential here." You'll see slides and hear all about the creation of the Riehls' stumpery, as well as the ones at Highgrove and at Dyffryn. It sounds like this is just the man to explain to us what is so magical about gardens featuring upside-down stumps.